Namibian retailers and food outlets relying on imported prime meat cuts from South Africa are feeling the pinch of the ban on meat exports to neighbouring countries due to the outbreak of Foot-and-Mouth Disease (FMD) earlier this month in South Africa. The only positive spin-off for South African meat lovers is that they could enjoy lower prices on red meat as trade partners ban imports. But in Namibia, empty meat shelves at South African franchises - who get significant amounts of prime red meat cuts from that country - are now testament to the severity of South Africa being placed on the no-export list by the World Organisation for Animal Health. 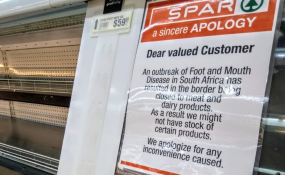 Outlets like Spar, Shoprite and Pick and Pay have informed their clients about the situation and in many cases have erected signs countrywide to inform the public about the shortages of certain prime cuts and these signs have gone up in front of near empty meat shelves. Spar's regional buyer, Johan Mostert, says it is a rather embarrassing situation for all these outlets but they are trying their best to fill the gaps by acquiring local meat cuts. "Spar outlets in Namibia are individually owned, and therefore owners decide on how reliant they want to be on prime meat cuts from South Africa. All Spar outlets do support the domestic industry and buy the bulk of their meat from local producers but some of the prime cuts are from South Africa. We are certainly feeling the pinch. Some outlets more than others, but Spar is committed to keep clients satisfied and we hope this situation gets cleared quickly. Until then, Spar will do its best to supply in all meat cuts if possible," he assured. The same promise came from other supernarkets that import meat cuts from South Africa. Spokesperson for the Limpopo Department of Agriculture and Rural Development (where the outbreak took place), Molebatsi Masedi, says the current situation was like a double-edged sword. "If this situation is prolonged, there are two main negative effects that could be experienced. Firstly, farmers who rely on red meat will not trade as we have already seen bans from a number of countries including Namibia; and two the pricing of red meat and red meat products will be impacted," he says.